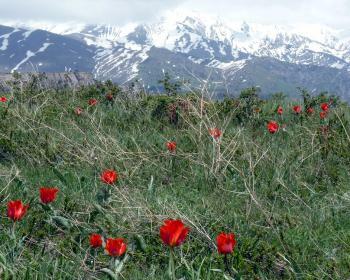 The Western Tien-Shan is a Central Asian mountain range known for its plant biodiversity. Especially its wild fruit and walnut forest are among the largest remaining in the world, thus providing a genetic resource for domestic fruit species. The site consists of 13 parks and nature reserves, divided over Kazakhstan, Kyrgyzstan and Uzbekistan. I visited this WHS in June 2017. I had already seen the snow capped Western Tien Shan mountains from afar in Turkestan, Kazakhstan and while crossing the border to Uzbekistan. However, since I had more free time available in Tashkent and since the best month to visit the inscribed reserves in Kazakhstan is in April/May (especially for flora), I opted for a very long day trip from Tashkent in Uzbekistan to the Bashkizilsay area of the Chatkal State Biosphere Nature Reserve. We left Tashkent with a private driver very early before sunrise heading towards Nevich on a 4x4 vehicle. We arrived near Nevich after 90 minutes on tarmac roads as it is only 65km from the Uzbek capital. The 4x4 vehicle came in handy from there onwards as we drove offroad, zigzagging uphill on what seemed like tractor trails on semi-cultivated hills. The blue glacial streams from the still snowy Tien Shan mountain peaks (35+ degrees when we visited in June!) got bigger and the small dwellings and ski 'resorts' got smaller the further on we drove. We stopped at around 900-1000m above sea level and started a moderate 9 hour loop hike up to around 1500-1600m in the Bashkizilsay area with a local mountain guide we had picked up near Nevich. 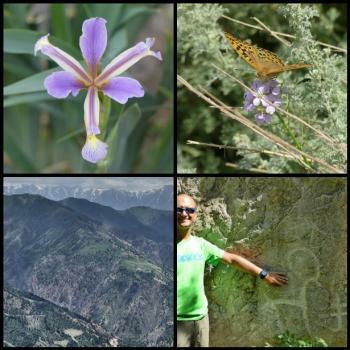 The UNESCO nomination file map and coordinates came in handy when organizing the trip and the guide took us on a moderate loop hike to appreciate the coniferous trees, gorges, small waterfalls, Tien Shan mountain scenery (bottom left photo), flora, fauna, etc. along the way. On the way back we hiked back on the other side of the gorge, going downhill towards the glacial water stream. The sound of the gushing water was incredible considering that we visited during summer at relatively high temperatures. The guide used the deep watercourse as a sort of reference point as the name given in the UNESCO nomination file actually refers to the the mountain slopes (or mesoslopes) on both sides of the Bashkyzylsaya watercourse (hence, Bashkizilsay area!). Apparently it is very dangerous to hike here in Spring because of the risk of avalanches. The variety and amounts of flora is impressive and the vibrant colours enhance the green Chatkal mountain ridges. I'm no botanical expert but my personal favourite was the purple and yellow iris (top left photo). Birds of prey were abundant but not too active because of the heat (mostly griffon vultures, kites and falcons). There were several finches and other small passerine birds I still have to identify when I have some time. However, June is the best time to spot different kinds of butterflies here and we effortlessly so at least 20 different kinds of butterflies (my favourite was the orange one, top right photo). Even though the Western Tien Shan mountains were inscribed for the natural beauty and importance, there are countless rock art engravings on practically every other flat rock face, some reachable (bottom right photo) and some which nowadays are less reachable but all depicting some sort of mountain ibex or 'stick men'. Tamgaly's WHS represents the highest concentration of rock art in Kazakhstan and Central Asia or perhaps the one with the widest variety but I wouldn't be surprised if any of the Stans try the transnational extension card. After the long hike under the scorching sun, we headed back to Tashkent for a hot bath and a lovely foot massage (which helped me and especially my partner appreciate the OUV of this WHS!). All in all, I'm glad to have visited the Uzbek part of this WHS as I could better understand its transnational value since the surrounding Tien Shan mountain scenery was literally transnational and the mountain guide himself had difficulties to pin-point which part was Kazakhstan and which part was Kyrgyzstan. 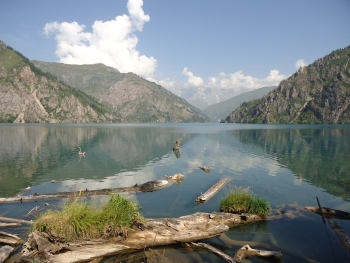 I'm glad I completed Uzbekistan's WHS but if I'll revisit it will surely be for the grand Timur monuments and not for the natural beauty of the Tien Shan mountains (which can easily be appreciated by visiting the summer resorts around the Lake Charvak reservoir further North from Tashkent). Site just visited, July, 2017. 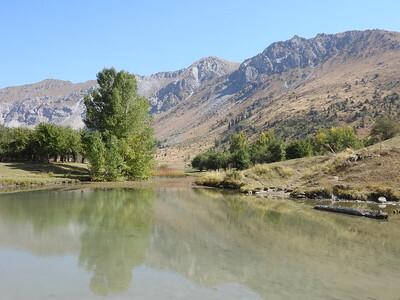 As Paul carefully described Aksu-Zabagly National Park I will focus on Sary Chelek Nature Reserve in Kyrgyzstan, which comparing both sites I found much more interesting. Sary Chelek is accessible by public transport. From Osh Bus Station (new one, north of the town centre) there is an everyday bus (marszrutka) to Sary Chelek (Arkit village) - 400 Kyrgyz som per seat, in theory it goes around 7.40 in the morning, when full goes earlier so it is advisable to be there around 7.20. You arrive in Arkit around 4 p.m.
Arkit seems to be well prepared for extensive tourism, many of village buildings are homestays, campsites, there are shops with basic food in the village. According to WHS website, being in Arkit, you are already within the borders of National Park, but the most interesting and scenic part of it lies a little bit more further, around the lakes. To get there you should pass a toll both (price for foreigners to enter the reserve is 400 Kyrgyz som, no discounts for students or children), there is also a 400 Kyrgyz som fee for a car but locals seem to avoid that. There are around 8 km (road is not paved) from Arkit village to Sary Chelek lake, although local people tend to double that distance. Official price for the car to get to the lake is around 1000-1500 som (both ways, including waiting time), if walking it should be around 2 hours, one way. Sary Chelek lake looks to be very popular destination among Kyrgyz as the provisional car park was almost full - certainly more than 100 cars were there. At the lake there are no official trails around, but you ca use some basic paths, but remember, they are not marked at all. It seems like it is impossible to walk round the lake (huge rocks). When planning to visit the W Tien Shan WHS during our May 2017 visit to Kazakhstan we were faced with the problem of which of the 7 locations situated inside that country (mostly in the general area of Shymkent/Taraz) we should aim for! In the end we chose the Aksu-Zhabagly Nature Reserve. It would appear that this is the most popular for non specialist visitors – it is set up to provide tourist entry to the reserve and is easy to access by road or rail from both the above mentioned cities – and thus for taking in on a route across Southern Kazakhstan without too much of a detour. The nomination of W Tien Shan received a negative evaluation from IUCN who, among other matters, were not happy with the diffuse nature of the serial locations. In the end the WHC inscribed it solely on Criterion 10 for its biological diversity – but 2 locations in Kazakhstan described as “Palaeontological sites” were still inscribed despite the removal of Criterion 8 (“examples representing major stages of earth's history, including the record of life, significant on-going geological processes in the development of landforms…” etc). And that of course raises the issue of why you might want to visit this WHS. It is undoubtedly most significant for its flora and fauna and Aksu Zhabagly majors particularly on the former. The UK Natural History travel company Greentours raves about its “ rare Primula minkwitziae and a wide range of bulbs including lots of Tulips and Juno Irises” . There are also mammals to see and some people staying at our guest house had obtained distant views of bear the day before we arrived! I suspect, however, that most WHS travellers will be visiting more for a mixture of that site “tick” and the chance to have a pleasant hike in mountainous scenery, rather than to invest a lot of time tracking down rare plants etc! I could imagine that it could provide 1 or 2 quite pleasant R+R days as a break from the logistical hassles of long train journeys, taxi rides etc across this vast country even if you had no great “need” to see particular plant species. If you do want to see the tulips it appears that 2nd half of April is the best time to go in normal years (even though the common wisdom is to go in May). In 2017 spring had come late and we were in “peak season” around May 8. The Kaufamannia, for instance, flower very soon after the snow has melted and it is necessary to track down hollows etc where the snow has lingered – or else climb higher and higher. If the mountain hike is more your thing then later could be ok – however you do not (at least “officially” and, as far as we could see this was strictly enforced) get into Aksu-Zhabagly without being accompanied by an official guide – who could apparently be just a “ranger” (indeed if you want someone with flora/fauna knowledge and some English you would need to ensure that you ordered, paid for and got this). One US guy staying at our guest house was very disappointed that he couldn’t just set off on a long mountain hike on his own as he was used to doing in so many other National Parks etc around the World. And then you will need transport into the Reserve. The village of Zhabagly (called “Novonikolaevka” on the map version provided in the Nomination file) has a couple of guesthouses specializing in providing services to tourists entering the reserve. It is situated around 12 kms from the train station at Tyulkubas which is a normal stop for trains on the Shymkent/Teraz line. The guest houses are set up to meet and take guests to/from the station. They are also set up to transport people into the reserve, provide horses and guides etc. Depending on the numbers of other visitors wanting a similar trip on the same day it should be possible to share transport - on our first day we shared the vehicle up to Aksu Canyon with 5 others. We reached Zhabagly by private car from Turkestan – having driven up there from Shymkent by car that morning. We departed Turkestan at 17.20 and reached Zhabagly at 20.00. The highway is mainly fast dual carriageway and by-passes Shymkent. We departed by train from Tyukulbas at 20.17 arriving in Teraz at 22.45. So you could arrive at Zhabagly one evening, overnight there, make a park visit the next day and get away the second evening. Probably the best “all round” outing which mixes scenery and flowers is to Aksu Canyon. It does not take you into the higher snow capped mountain areas and, as canyons go in Worldwide terms, I would only put it in the “middling” class – around 300-500m deep and c 12kms long, but still worth seeing if you are “in the area”. The boundary of the inscribed WHS at this point follows the canyon edge very closely – you will need to get to the ranger station at 42.331600, 70.373303. Until that point on the southern side there is mainly pastureland and summer arable fields, though still with some nice areas of Tulip. The surfaced road stops some kms away and, following rain, our non 4x4 had problems crossing the grasslands. Once there you can both descend to the canyon floor and/or go along the edge looking at flowers, and distant mountains (photo). With a knowledgeable guide you should see a fair number of plants including the special tulips and natural hybrids. The birds were ok, but were limited in number and this is not a prime area for them. We had another walk on a second day which was mostly within the reserve, following the Zhabagly river with lunch at 42.406611, 70.580849. This went more into the mountains and there were some additional plant, bird species etc – but, unless you were particularly wanting another walk and more flower hunting, didn’t really add a great deal! At no point on either of the walks was there any sign indicating that we had entered a UNESCO WHS. The site had only been inscribed for under a year at the time of our visit but we got the impression that UNESCO wasn’t particularly “popular”. Aksu Zhabagly is the oldest nature reserve in Central Asia having been created as early as 1926 – and there were signs around extolling that! As one of the people we spoke to said (in Russian) – “We will put up UNESCO signs when UNESCO pay for them…. We have been looking after this place for 90 years without their help….We don’t need well paid bureaucrats in Paris to tell us what to do…..”!). Whilst we were there, some hapless “peasants” were being fined a large amount of money (in Kazakh terms) for collecting mushrooms from within the reserve. IUCN commented that “(Aksu-Zhabagly) is one of the best preserved areas in the region” but was still concerned about poaching and illegal grazing and concluded that protection wasn’t good enough. Inevitably the question arises as to which guesthouse to use. “Zhenya and Lyuda’s boarding house” (now called “Aksu Inn”) is the long term favourite, was mentioned in our 1996 edition of LP ‘s “Central Asia” and is used by Greentours. Zhenya is very knowledgeable about flowers and birds (and has adequate English to explain them), has the necessary vehicles and contacts etc but I can’t say we were that satisfied with a number of aspects and we felt that he/his guest house were relying a bit too much on past reputation. In our opinion the food and accommodation was poor for the rather high price and his guiding often seemed more about him going ahead to get good photos to sell than in staying with his customers. I understand that the main alternative also has "problems"! You will just have to investigate and make your own choice!